I have some more new projects to share using Taylored Expressions newly released goodies for the month of June. All new products are available for purchase from Taylored Expression Shop. 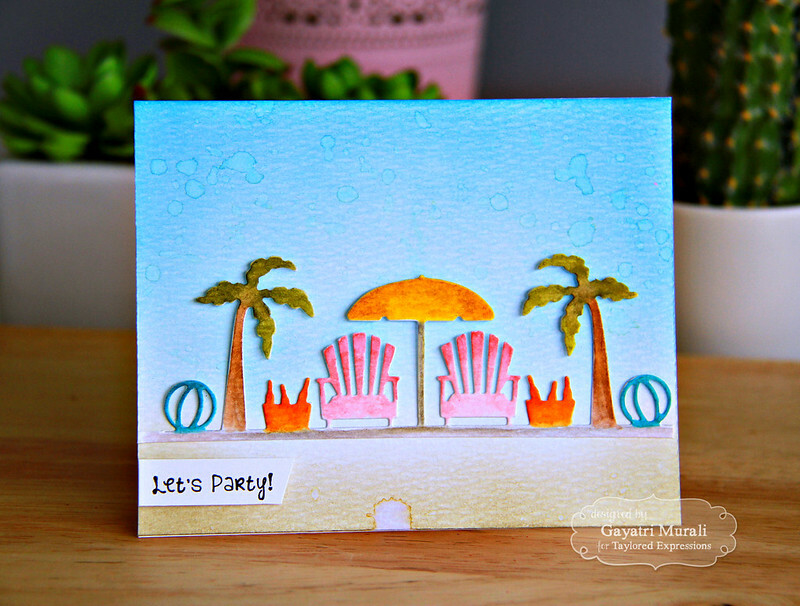 I particularly love this card using Summer Love stamp set. 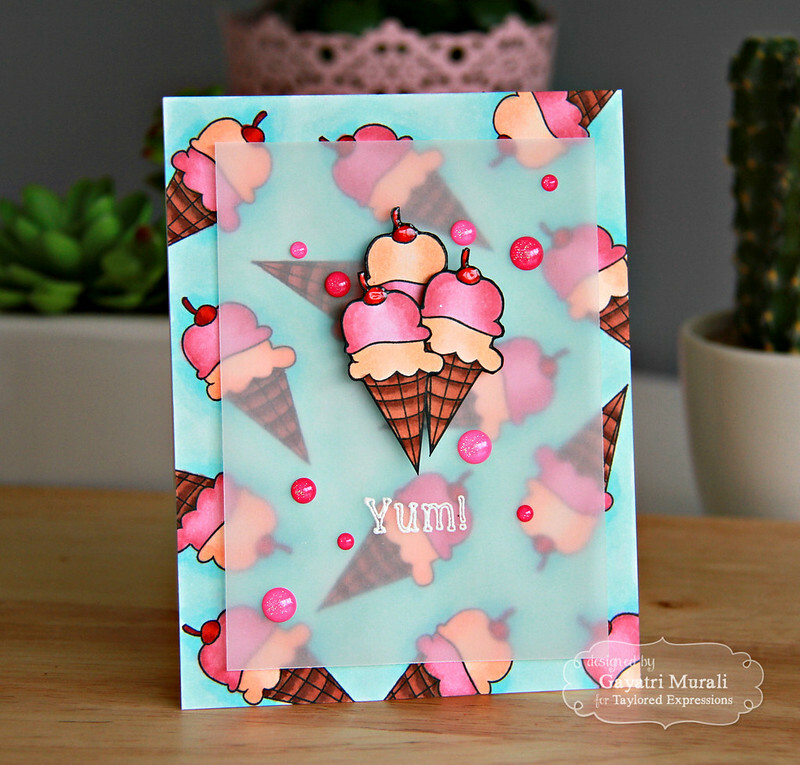 I stamped and copic coloured the ice cream cone and then the background too. This is one of my favourite technique. I love to create my own background. It is so much fun to stamp and colour thus giving you a custom made background. I then toned down by adding a layer of vellum. 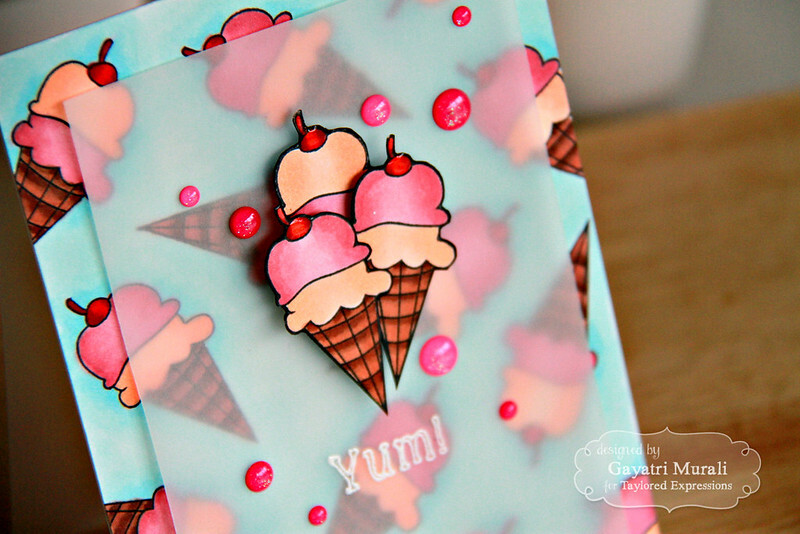 The focal point is the same ice cream cones stamped, copic coloured and cut out by hand. These cones are then clustered and adhered to the centre of the vellum. The sentiment also from Summer Love stamp set is white heat embossed. Finally I added some glossy accent on the cherries and beautiful sparkle enamel dots from Doodlebug to accent the colours and bring the card together. Here is a closeup! The next card uses Pool Party die from Taylored Expressions. 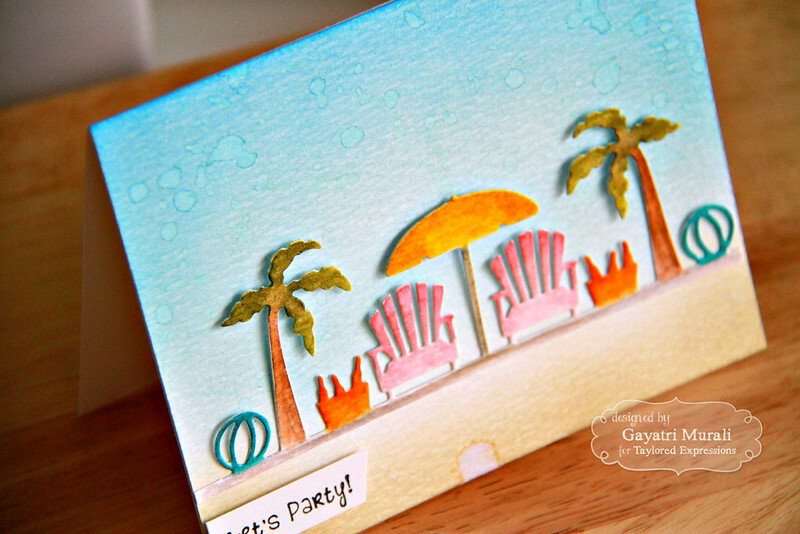 I die cut the Pool Party border die using watercoloured cardstock. Then watercoloured the elements on the die. For the background, I sponged some Tumbled Glass, Salty Ocean distress inks for the sky and Frayed Burlap for the sand. I then brush using wet brush to smoothen and blend the colours. Also I spatter some plain water. Once dry, I adhered the Pool Party die on the card front. The sentiment is from Summer Love stamp set. Here is a close up of the card. I love these dies below. 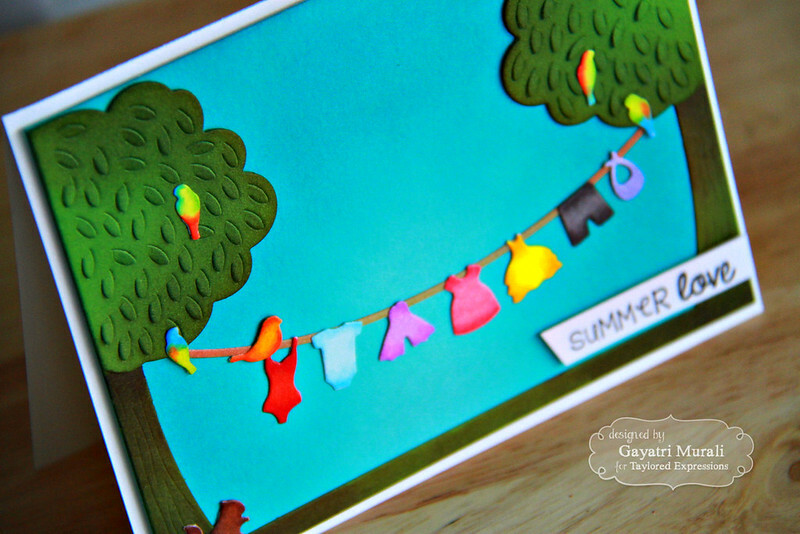 So summer and great to coordinate with other dies and stamp set from Taylored Expressions. I love love On the Line Cutting Plate. When I saw it, it was a must have die in my collection. I love that the trees can be used with of without the leaf layers. They frame the card beautifully and so much space to add, clouds, landscape and other elements like animals, house…. This die set also comes with a clothes line and some banners and lantern. On my card I have used On the Line Accessories dies on my clothes line and the birds and squirrel are also from the On the Line Accessories die set. I die cut the tiny elements using white card stock and copic coloured them all. So adorable. I also sponged some distress inks on the tree leaves and blue panel to add to some shading. Perfect clear blue sky summer’s day scene. Here is a closeup. Finally I have couple of cards using Wild About you stamp set and dies. 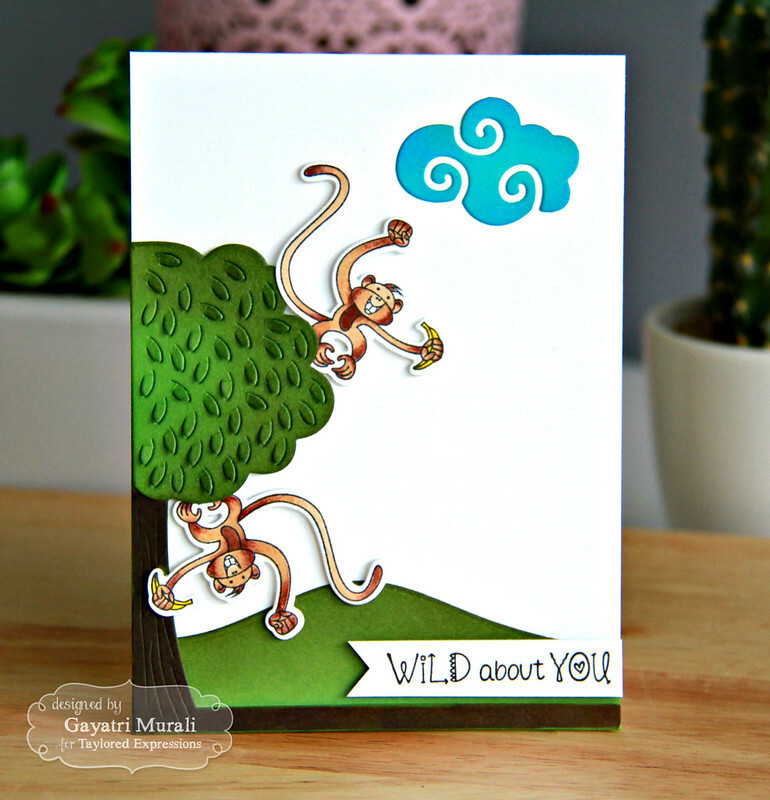 For the above card, I stamped copic coloured and die cut the monkeys, I die cut the On the Line cutting plate using Chocolate Truffle cardstock and also a hill top using the Build a Scene – Rolling Hills die using Sweet Basil card stock, sponged Mowed Lawn distress inks for some shading. I layered and adhered them on the Sugar Cube card front, then added the monkeys tucked under the tree. I then added one Swirly Cloud die cut using Cookie Monster cardstock. The sentiment is from Wild About You stamp set. ON this card, I die cut Build a Scene – Rolling Hills using Sweet Basil cardstock, sponged some Mowed Lawn distress inks. 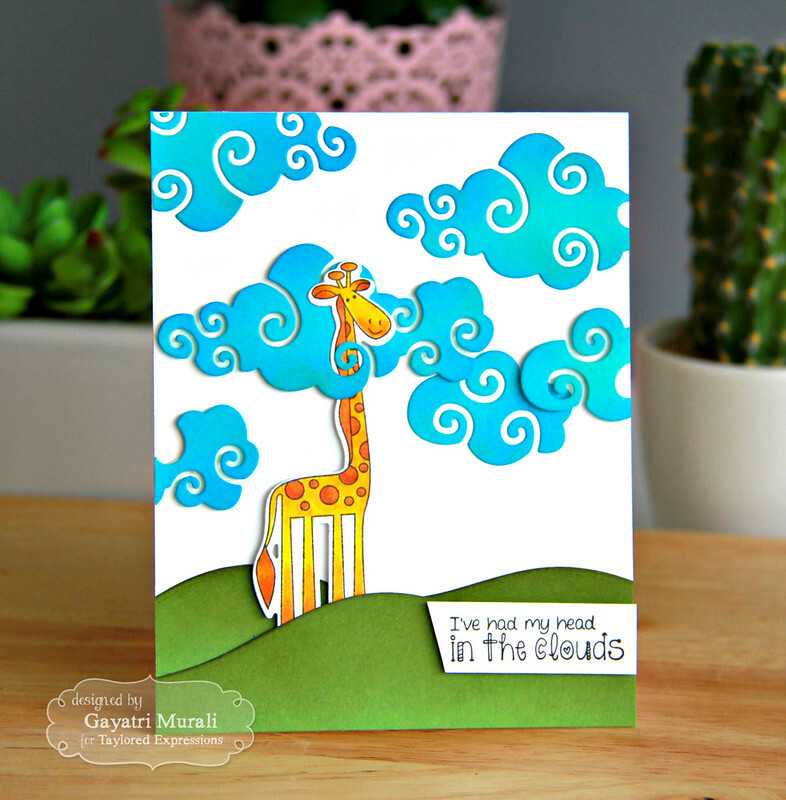 For the clouds, I die cut using Swirly Clouds die set in Cookie Monster cardstock. Then sponged some Salty Ocean distress inks. The giraffe is from Wild About You Stamp Set stamped, copic coloured and die cut using the coordinating die. The sentiment is also from the same stamp set. There are so many beautiful stamp set and dies which are perfect for summer from the Taylored Expression new release. Head over to Taylored Expression gallery to see more projects from the designers and all new goodies are available at the Taylored Expressions Shop for purchase. very positive and bright cards!! thanks for sharing, they are amazing! The clouds are making me smile! These cards are amazing! Love the ice cream cones and pool scene in particular!